The Comair Lugano is a luxurious wash station ensemble that mixes style with customer comfort. 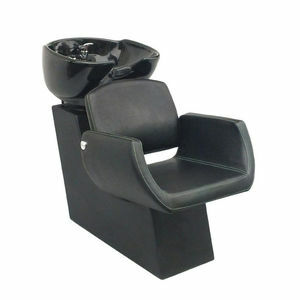 Comprising of a tilt-able black porcelain basin with a single-lever mixer tap, a pedestal of black fibreglass and comfortable, padded chair, it's a stylish wash station that would smarten up any salon or barbers shop. Easy to maintain and keep clean, the Lugano also features an adjustable backrest to further enhance the customer's experience. Dimensions: 930 mm (h), 620 mm (w), 1185 mm (d). Please allow 4–6 weeks for delivery (kerbside only). £1,042.80 (inc. VAT) Why no VAT? We're a trade wholesaler and quote our prices without VAT to help our VAT-registered customers understand the true cost of a purchase.